To create a high-quality video version of your presentation to effectively communicate your message to your audience, you can save it to a compatible format and play it as a video on your Nixplay Signage Display. Depending on the type of presentation program you are using, there are many options to make your presentation a video playable on your Display. We will focus on those most suited to be used in your Nixplay Signage Displays, saving you time and effort. Note: While Nixplay Signage continuously upgrades its Display compatibility to play a wider range of video formats, converting your presentation to most widely supported formats is highly recommended. Commonly used video formats which you may use include: MPEG-4 video file (.mp4) or Windows Media Video (.wmv) for Microsoft Powerpoint, Flash video files (.flv) from Adobe Flash and QuickTime movie (.mov) for Apple Keynote. Click Save to ensure all your recent work has been updated in PowerPoint presentation format (.pptx). Then, on the File menu, click Save & Send. Click Create a video under Save & Send. Click the Computer & HD Displays down arrow under Create a video to display all video quality and size options. Choose Computer & HD Displays for video quality option. Congratulations, you have now converted your presentation into a .wmv file video. You may now upload the video on Signage Web App and view it on your Display. When you have created your presentation and all the elements and animations are ready, you're ready to create a video file. In the first drop-down box under the Create a Video heading, select the video quality you want, which pertains to the resolution of the finished video. The higher the video quality, the larger the file size. 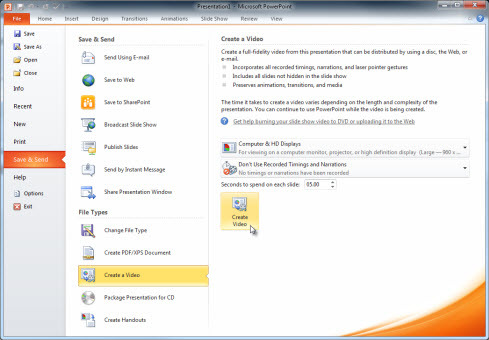 The second drop-down box under the Create a Video heading tells whether your presentation includes narration and timings. In the File name box, enter a file name for the video, browse to the folder that will contain this file, and then click Save. Choose Share > Export and then click QuickTime. Viewers can’t control how the slideshow advances; the slideshow plays using the timing you specify in the next step. Specify how long slides appear and how long it takes to complete object builds (animation) by typing values in the Slide Duration and Build Duration (animation) fields. How long each fully built slide remains on the screen after the last object build is complete. The number of seconds between the beginning of one build stage and the next in each object build of animation. There is no delay between the moment a slide first appears on the screen and the first stage of an object build. The slideshow plays only once. Preserves the best playback quality, but these movies are large and are therefore more difficult to transfer through email or across the web. To include the slideshow soundtrack or the recorded audio, select the appropriate Audio checkbox. Click Next, type a name for your movie, choose a location in which to store it, and click Export. Note: If the slideshow includes a soundtrack, two movie files are created. The file with “soundtrack” appended contains only the audio and can be discarded. Now that you have successfully converted your presentation into a movie, you should be able to view the movie on your Nixplay Signage Display. How Do I Create a Google Slides App?